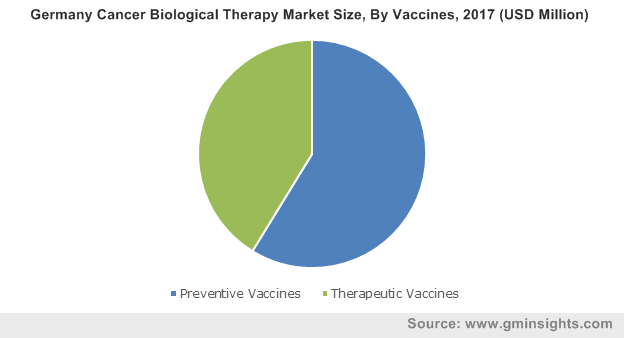 Cancer biological therapy market size was valued at USD 69.1 billion in 2017 and is expected to witness 6.8% CAGR from 2018 to 2024. Rising prevalence of cancer worldwide is the key factor that will drive cancer biological therapy business growth during the forecast period. According to WHO cancer is the second leading cause of death worldwide, accounting for more than 9.5 million deaths in 2018. Additionally, prevalence of cancer is estimated to increase by 50% in 2020. Increasing consumption of alcohol and tobacco have led to rise in global cancer burden thereby surging cancer biological therapy industry growth. Growing R&D investments by key industry players in cancer biological therapy will augment industry growth in near future. Furthermore, increasing healthcare expenditure and growing awareness about cancer has stimulated demand for effective cancer treatment. Technological advancements in oncology will further favor business growth. However, high cost and complications associated with anti-cancer drug therapy may impede cancer biological therapy market growth in coming years. Vaccines segment is estimated to witness lucrative CAGR of 10.9% during the forecast timeframe owing to worldwide increasing prevalence of cancer coupled with rising awareness regarding preventive measures for cancer. Growing demand for preventive vaccines such as human papilloma vaccines (HPV) and hepatitis B vaccines (HBV) will drive the segmental growth. Moreover, utilization of therapeutic cancer vaccines to inhibit growth of relapsed tumors that are refractory to surgery, radiation therapy and chemotherapy will further foster segmental growth during the forecast timeline. Monoclonal antibodies segment accounted over 34% revenue share in 2017 and is projected to show significant growth during the forecast period. Ability of monoclonal antibodies for targeting specific proteins on the cell surface will increase its adoption in cancer treatment. Furthermore, increasing patient preference towards advanced cancer biological therapy to avoid risks associated with anti-cancer drug therapy will further augment segmental growth over the coming years. 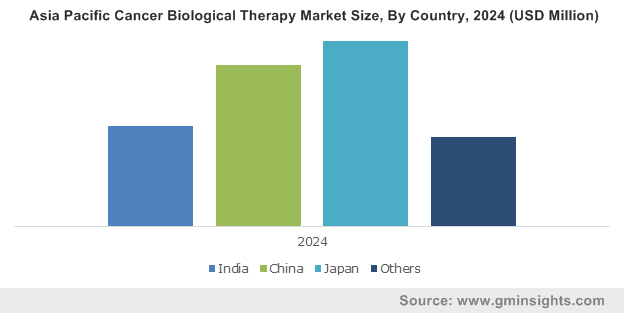 North America cancer biological therapy market accounted for USD 28.4 billion revenue in 2017 and is expected to witness considerable growth during the forecast period. Rising incidences of cancer in the region coupled with increasing geriatric population base will drive business growth. Technological advancement in cancer therapies, increasing R&D initiatives by industry players and government support towards development of advanced cancer therapies will favor industry growth. Awareness among people regarding cancer treatment, high healthcare expenditure and availability of advanced infrastructure will stimulate North America cancer biological therapy industry growth over the forecast period. Europe cancer biological therapy market held significant revenue share in 2017 and is anticipated to show 5.8% CAGR over the analysis timeframe. Increasing burden of cancer in the region, presence of huge elderly patient pool and developments in cancer therapies will foster business growth. Rapidly evolving techniques in molecular biology, sophistication in health care as well as improvements and innovative approaches in technology will propel the industry growth over the forecast period. Rising number of initiatives to promote the value of effective cancer treatment will further favor Europe cancer biological therapy industry growth. 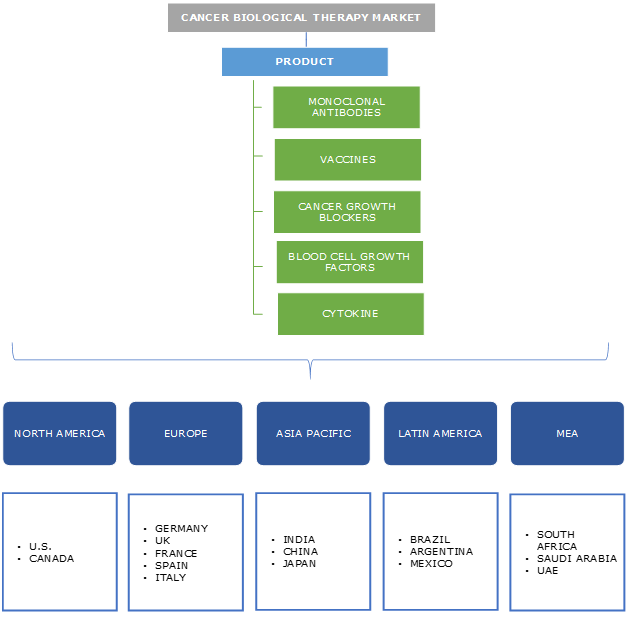 Some of the major industry players operating in the cancer biological therapy market include AbbVie, Amgen, Astellas, AstraZeneca, Bayer, Celgene Corporation, Eisai, ELI Lilly and Company, F. Hoffmann-La Roche, GlaxoSmithKline, Incyte, Merck, Novartis, Otsuka, Pfizer, Sanofi, Seattle Genetics, Spectrum Pharmaceuticals and Takeda Pharmaceuticals. The industry players primarily focus on implementing several strategic initiatives including new product launch, acquisition and mergers that help them in strengthening their existing market position. For instance, in December 2018, GlaxoSmithKline announced acquisition of TESARO, an oncology-focused biopharmaceutical company. This acquisition will help company to enhance its oncology business and foster company’s growth. Immunization was discovered more than 200 years ago, that marks the beginning of biological therapy. Centuries ago, a surgeon in New York, William Coley, started using biological therapy to treat cancer patients. However, some people appeared to enter remission after developing certain bacterial infections. He then injected cancer patients with live bacteria, and later with filtered toxins. This method of treatment known as Coley's toxins was used for decades. Further, Paul Ehrlich, won Nobel Prize in 1908, for postulating that the surfaces of cells carried, side chains or receptor molecules. According to him, antibodies attached to the side chains caused the release of antitoxins. He further worked on developing antibodies that could target invaders. Later, the 1980s witnessed encouraging results of interferon usage to treat hairy-cell leukemia, a rare blood disorder. The FDA approved interferon used in this disease and was further used in the treatment of AIDS-related Kaposi's sarcoma, chronic myelogenous leukemia as well as genital warts. Recently, Steven Rosenberg a researcher at the U.S. National Cancer Institute, discovered the ability of directing human body to discriminate between cancerous cells and healthy ones. In 1992, FDA approved genetically engineered IL-2 for use in advanced kidney cancer treatment. Further, clinical trials to determine the use of interleukin (IL-12) against AIDS and metastatic cancer were started in 1994. With the advent of technological advancement and better understanding of the biology of cancer cells, focus on development of biologic agents to control cell growth has increased in the recent years. 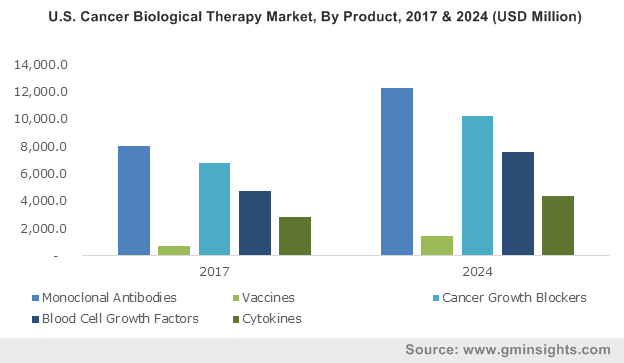 Growing R&D investment and favorable government policies to support cancer treatment will drive cancer biological therapy industry growth in foreseeable future.